Home inspection clients are often unsure what questions to ask during home inspections. One mistake is failing to ask any questions that you may have. I can assure you if you feel your question is too silly to ask you should ask it anyway. Chances I can answer it and put your mind at ease. I can count on one hand the times I have been asked one of these important questions. The first question you should ask is one that I have yet to be asked by any home buyer since 1993 despite having 10,000 or so clients (except by the few who have read this). “May I please see your home inspector license”? 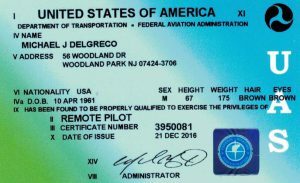 Better yet, may I see your FAA Remote Pilot Certificate? Please ask. I have been carrying ID’s in my wallet for years not only because I am required to do so by law, and so once a year or so I get to show them to a client. If your inspector can’t find his or hers, it is time to stop the inspection and try again with another company. 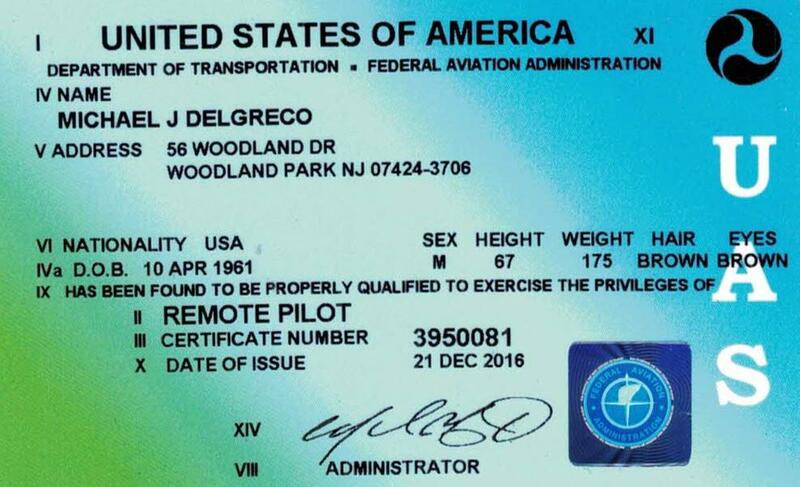 FAA Remote Pilot Certificate 395008 allows Home Inspector Michael Del Greco to inspect a high roof. The very next question to ask during your home inspection is to ask the home inspector is “Are you working for my real estate agent?” If the answer is YES then that home inspector is not working for YOU as the home buyer. Stop the inspection and run away. Set up another home inspection with a real home inspector. Please realize if you are hiring the home inspector and you are paying for the home inspection, you are entitled to have a home inspector who is working for you and only you. If the home inspector indicates, the real estate sales person is the home inspection client or worse yet does not understand the question run away QUICKLY. Another question you should be asking the home inspector is “What is your education, training, and experience”. A good home inspector will have a decade or so of home inspection experience, a few hundred hours of classroom experience and be able to tell you about the last few continuing education classes attended. New Jersey law requires inspectors to have at least 40 hours of continuing education in home inspection every two years. I have taught many of those classes and found many students learned quite a bit. Home inspectors expect questions to be asked during home inspections. If you ask a home inspector a question, then nod your head up and down when you hear the answer the home inspector is likely to feel your question was answered. If you do not understand the answer a home inspector gives you, tell the inspector. I have no problem at all explaining things more than once and in different ways until the buyers understand. Ask the home inspector about any of your concerns. Home inspectors can answer your questions about most issues. However, the above questions are outside of the field of expertise of most home inspectors. 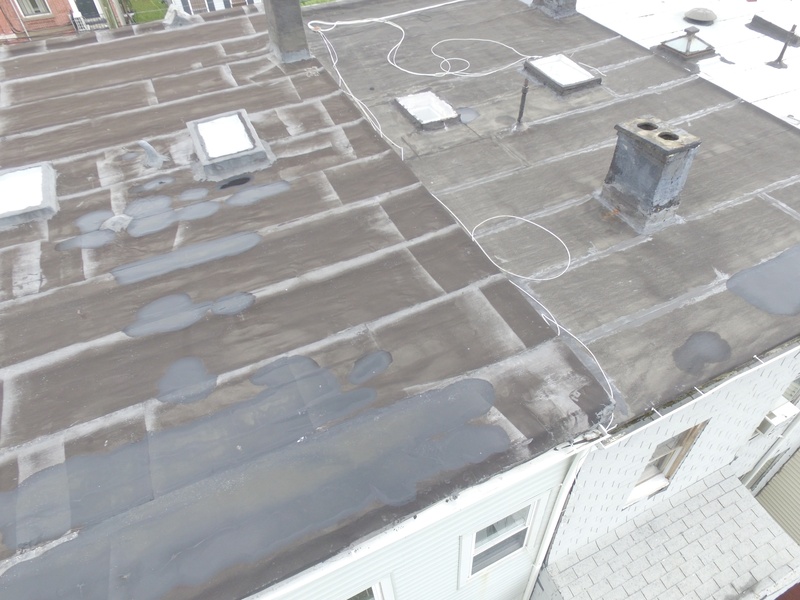 Feel free to question the home inspector about the drainage around the exterior of the home, how to help keep your basement dry, how to prolong the useful life of the roofing and if there are problems with the roofing and or siding. Home inspectors answer those questions all the time and can provide useful tips. While outside, ask the home inspector if there are any signs of improperly abandoned oil tanks, if there are, the home inspector can advise you and your attorney how to proceed. Home inspectors can tell you how many amps the service is, the service voltage if there is room to expand within the electric panel, if amateurs have caused problems with the wiring and if the wiring appears to be safe. If the home is older make sure you ask the inspector if aluminum wiring or knob and tube wiring exists, both are potential fire hazards and may make it difficult to get home owner’s insurance. When the home inspector is inspecting the plumbing system ask if the sewer clean out cap is newer. If it is suspect problems with the sewer pipe may exist and budget for replacement. Ask the inspector how old the plumbing supply, waste and vent pipes are. If the pipes are old replacement may be necessary sooner than you would like. Heating systems must be inspected and you are entitled to be told how the heating system works. If you do not know the parts on the boiler or furnace, now is the time to find out. Ask the home inspector questions about what part does what and why they are there. Every home inspector I know is anxious to teach you everything he or she knows. If the inspector does not know the names of the parts on the equipment, you should be concerned. Many buyers have questions to ask home inspectors about the structure of the home. Keep in mind home inspectors can not see into or through walls. Home inspectors can see what they can see and make a few educated guesses. Home inspectors are likely to miss hidden damages from insects, rot, water and construction defects unless obvious symptoms exist. Home inspectors who provide an answer of “I do not know” when asked the question is there hidden damages are not being evasive they are being honest. Please allow us the opportunity to assist you! Michael Del Greco, President, Accurate Inspections, Inc.
Home Inspection Instructor Morris County School of Technology (2002 – 2005). We will be happy to e-mail at no cost or obligation a Neighborhood Environmental Report detailing the locations of Leaking tanks, Chemical Spills, Residential oil spills, Clandestine drug labs and Superfund sites for any street address in New Jersey! We provide New Jersey home inspections in Bergen, Essex, Hudson, Morris, Passaic, Somerset and Union Counties in New Jersey. We accept cash, check, money orders and credit cards. When it is time to hire a New Jersey Home Inspector, you want us on your side. Let's put things in perspective: If during the purchase of a $500,000 home you spend $250 additional for a home inspector who puts your interest above all others - it is only an additional .05% of the $500,000 home! If the inspection turns up little wrong with the home (few do), you've bought some relatively inexpensive peace of mind. If the inspection finds serious problems (most do), then the few hundred dollars you invest in our home inspection could end up saving you many thousands of dollars. Obtaining home inspections by an expert home inspector can stop you from buying a money pit. I am a candid, careful and thorough NJ home inspector. Our very thorough reports are prepared by a meticulous full time home inspector with over 20 years experience are used by many to help get the seller to pay for repairs other inspectors do not even find!